Yard Tools — Cardale Tech Corp.
Cardale Tech Corp. Manufactures a series of small yard implements. They are designed to be used with small tractors and quads. The Yard Scraper is a small scale box type scraper. It is designed to be used with your yard tractor or quad. When using the your tractor the scraper works great when being used with a three point hitch to lift and lower the scraper box. When using the vehicle without a three point hitch the scraper can be raised and lowered using a hand lever. The scraper can be used for regular forward scraping and for backwards blading. If desired you can lower the smooth bar in front of the blade in order to work in a much less aggressive manner. This helps you smooth out any rough spots you might be working on. The Four Bar grader is a small scale grader. It is designed ti be used with your yard tractor or quad. The grader is meant to help you smooth out any gravel or dirt. It is excellent at working in your yard on drive ways or even on your local baseball diamond. 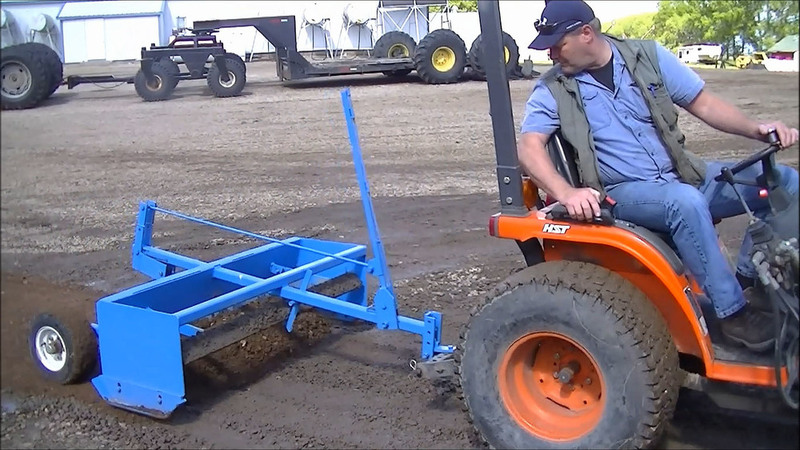 The grader has 4 grading bars that from front to back become less aggressive with each bar, This allows the first bar to deal with the roughest of bumps and puddles while each of the following bars ensure that more and more smooth work is done. The Four Bar Grader can be lifted with a hand lever so that the Grader can be moved easily.